The Vaunn Medical Foot Stool is designed with one concept in mind "STABILITY". We want a footstool that offers maximum stability and durability like no others in the market. Purchase our product with confidence. We offer a full refund to your purchase if you feel that our product is inferior. Our lifetime warranty also guarantees our step stool to last forever and rust free too. 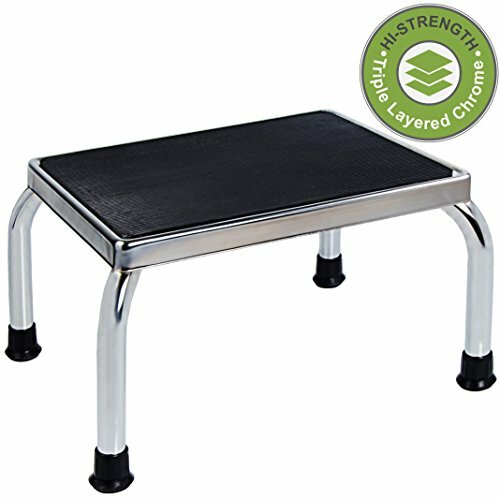 The Vaunn Medical foot stool holds up to 300 lbs. Dimension: 17"(W) x 14"(D) x 8.5"(H). Vaunn Medical is a registered trademark of USPTO. We will actively and aggressively pursue any parties who infringe on our intellectual property rights to the maximum extent allowed by the law. Beware of Imitation, Buy Original. MULTI-FUNCTIONAL & VERSATILE - Used by medical professionals in clinics, hospitals and laboratories.